Too much mammography is no good for you. But, is it any good at all? Is Breast Self-Exam Right for Me? More answers and uncertainty on breast cancer screening: Time for a big change? If there is one thing you can say about science and medicine it s that it is always changing. Bacterial infections used to be easily treatable. Now antibiotics don t work in many cases. AIDS was a certain death sentence 20 years ago. Now HIV-infected people have life spans that are not too different from non-infected individuals. This kind of change is not restricted to therapies. Methods of diagnosis have changed radically (testing for the BRCA1 gene, for example) and the conventional wisdom about diagnosis and disease prevention is in constant flux. There is no better example than the PSA test for men. It has gone from the Holy Grail of prostate cancer diagnosis and treatment to a test which many doctors and scientists are now regarding as doing more harm than good. As was the case with PSA screening, the utility of routine mammography has also come under scrutiny. This is hardly the first time that dogma about breast cancer detection has been challenged. A huge study of more than 250 thousand women in China that was conducted between 1989 and 2000 knocked out the cornerstone of breast cancer detection breast self examination (BSE). This was evident in the conclusion of the paper that analyzed the study. The authors concluded: Programs to encourage BSE in the absence of mammography would be unlikely to reduce mortality from breast cancer. Women who choose to practice BSE should be informed that its efficacy is unproven and that it may increase their chances of having a benign breast biopsy. So, not only did BSE fail to save lives, but it subjected many women to the physical and emotional trauma of unnecessary biopsies. This is perfectly analogous to the PSA test doing more harm than good. Over the past few years, the Holy Grail of breast cancer prevention routine screening by mammography has been undergoing increasing scrutiny. And the results are startlingly similar to the examples above. In 2009, the semi-official United States Preventive Services Task Force significantly reduced the previous advisory on screening mammography, finding that in a large population, routine screening among women under 50 did more harm than good, and recommended that women between the ages of 50 and 74 get screened only every other year a dramatic reduction in frequency. It caused quite an uproar in many quarters. Now, a new Swiss study entitled Abolishing Mammography Screening Programs? 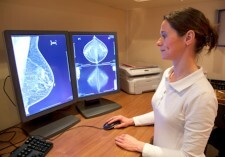 A View from the Swiss Medical Board, which was published in the April 16th issue of the New England Journal of Medicine, adds further to the emerging belief among science-based authorities that routine screening by mammography, until recently an absolute given in the fight against breast cancer, may fit the examples above a subject that is guaranteed to generate plenty of controversy and confusion. Authors Nikola Biller-Andorno, M.D., Ph.D., and Peter JÃ¼ni, M.D., along with other experts were charged with reviewing data on mammography and outcome in numerous trials some going back decades involving hundreds of thousands of women. Their conclusions will shock both men and women. Their Perspective piece in the NEJM also included data from large national studies from Canada and elsewhere, included in the Cochrane database: The recently published extended follow-up of the Canadian National Breast Screening Study is likely to provide reliable estimates of the extent of overdiagnosis. After 25 years of follow-up, it found that 106 of 484 screen-detected cancers (21.9%) were overdiagnosed. This means that 106 of the 44,925 healthy women in the screening group were diagnosed with and treated for breast cancer unnecessarily, which resulted in needless surgical interventions, radiotherapy, chemotherapy, or some combination of these therapies. Also: In addition, a Cochrane review of 10 trials involving more than 600,000 women showed there was no evidence suggesting an effect of mammography screening on overall mortality. The authors also addressed the huge disconnect between women s perception of the utility of routine mammography screening vs. the actual impact on outcome. We were disconcerted by the pronounced discrepancy between women's perceptions of the benefits of mammography screening and the benefits to be expected in reality. The graphs below represent the beliefs and realities of more than 1000 women aged 50+ in the US. The data in the first graph are derived from a survey of over 1000 women who were asked whether they believed that mammography would reduce breast cancer deaths by at least half. These women collectively believed that of 1000 women who underwent mammography screening, 80 would die from breast cancer, while there would be 160 deaths in women who did not undergo screening. The second graph shows the data from the study. The differences are shocking. In reality, of 1000 women who actually were screened, there were only 4 deaths from breast cancer. And in the group of women who were not screened, that number was only 5. Which begs the question: Is routine mammography doing any good, or is it doing more harm than good? ACSH s Dr. Gil Ross addresses this: Over the course of the past five years, a veritable sea-change in the approach to reducing the toll of breast cancer has occurred. This is the result of large-scale evaluations, both retrospective and prospective, of the actual benefit vs. needless harms that result from routine screening mammography. While undoubtedly some potentially lethal cancers are found and excised thanks to such screenings, the small number of lives saved from breast cancer deaths are far outweighed by the human and economic toll of overdiagnosis and overtreatment. In simplest terms, hundreds of women have excessive testing, biopsies, lumpectomies, and even mastectomies for lesions found that were not and never would have been life- or health-threatening. It is all but certain that some of these women were actually severely harmed or even killed by unnecessary interventions, but their stories will never be told on those TV benefits to find the cure, nor on those pink-ribbon marches yet the harms done are just as real, more so, than missing a low-grade malignancy on a screening mammography that was not done. The tough job will be convincing women, their loved ones, and even doctors that routine screening mammograms should be relegated to the dustbin of history. NOTE: none of this applies to women with lumps, strong family histories of breast cancer, or genetic mutations such as BRCA-1 and -2.